In 2008, when I was between jobs for a while, I decided to build an HF antenna with more directivity than a simple dipole. Installation at my QTH basically had to be on my terrace, so space is rather limited. Such a directional antenna requires at least two elements, a full-size antenna for wavelength over 10 mtr will not fit, and 10 mtr is (usually) not my favorite band. So I narrowed it down to a simple half-size 2-element "Yagi". This famous type of antenna was invented in Japan in the 1920s, by Dr. Hidetsugu Yagi and Dr. Shintaro Uda. So it should actually be referred to as a Yagi-Uda antenna, but unlike the Japanese patent, only Mr. Yagi's name appeared on the 1926 US patent application. Substantial additional research was subsequently done by Yasuto Mushiake. The 2-element version is the simplest form: a dipole as the driven element (feed element), and a passive "parasitic" element at some distance, in parallel with the driven element. This second element is either a "reflector" or a "director". 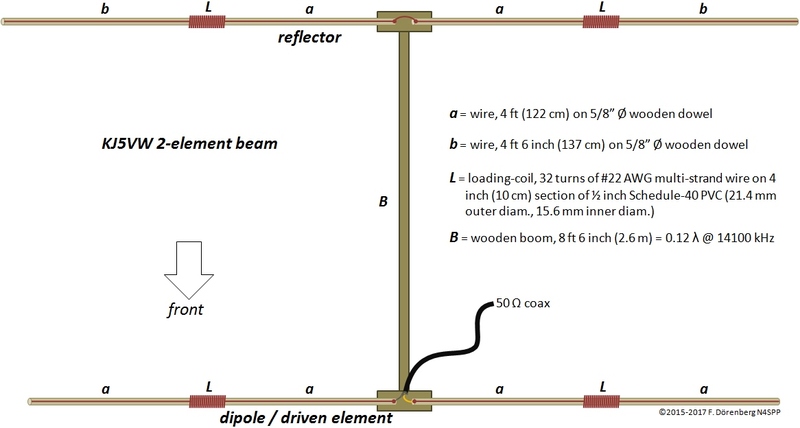 A reflector is slightly longer than the dipole, and placed behind it. A director is slightly shorter than the dipole, and placed in front of it. The coupling (interaction) between the two elements causes the transmitted energy to be concentrated in the forward direction ( = looking from the reflector to the dipole, or from the dipole to the director). I.e., a "beam" is formed. Hence this type of antenna is sometimes called a "beam antenna". In a multi-element Yagi antenna, there is (typically) one reflector, and one or more directors. In accordance with the universal Law of Diminishing Returns, each additional director N+1 increases the gain relatively less than the adding the preceding director N.
As with all "beam" antennas, performance characteristics of a Yagi antenna are front-to-back ratio (F/B, a.k.a. front-to-rear, F/R), gain (in the forward direction), feedpoint impedance (hence, SWR bandwidth), and side-lobes These characteristics depend in a complex manner on design parameters such as spacing between the elements and element tuning (electrical length, element diameter and tapering, matching system,...), installation height, and the environment. Ref. 1, 2. Yagi antennas are "mono-band". However, it is possible to combine several 2-element Yagis on the same boom, e.g., for the 20-17-15-12-10 meter band (ref. 3). 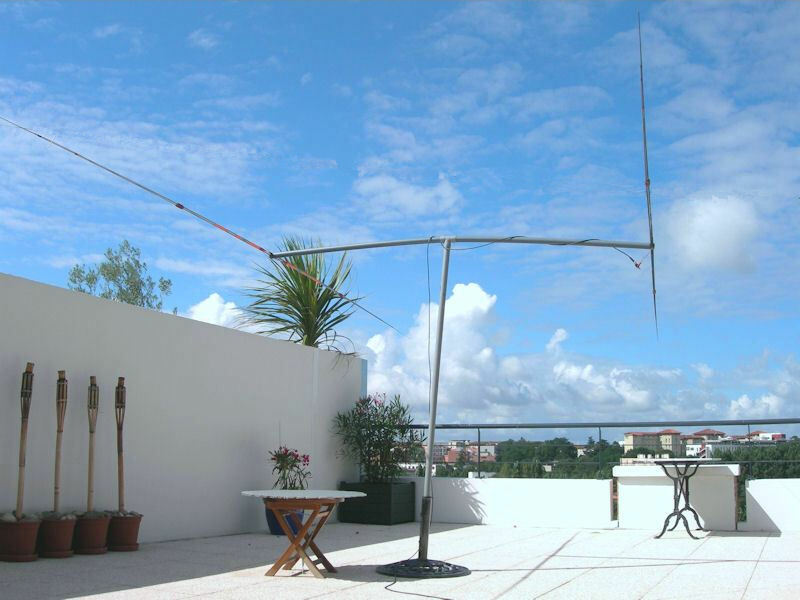 A full-size ( = ½λ) dipole antenna for the 20 mtr band spans about 10 meters (33 ft). Searching for a half-size half-size 2-element Yagi, I found the design by Gary Hanson (KJ5VW), ref. 4. See ref. 5 and 6 for similar designs. Note that scaling-down a full-size antenna by more than 50% causes significant performance reductions. However, I have actually built very small loaded dipoles for 80/40/20 that are scaled-down by 95% (!) and work interestingly well for their size (but, sorry, no miracles...). To make a shortened dipole (i.e., span < ½λ) resonant at the desired frequency, some form of loading is required. One standard solution is "inductive loading": adding a loading coil to each "leg" of the dipole. The loading coils is placed somewhere between the feedpoint and the tip of each dipole "leg". The current-distribution along the main elements is such that the current is highest at the feedpoint. Placing a loading coil here, requires the smallest inductance. The current-distribution tapers off, from maximum at the feedpoint to zero at the tip of the radiator element. So, as the loading coil is placed farther away from the feedpoint, a larger inductance is required. At the tip of the main element, the current is zero. This would require an infinitely large inductance. See the diagram below. The placement of the coils does affect the shape of the current distribution, but does not change the fact that it is maximum at the feedpoint and zero at the tip. Center-loading a dipole (also called "base loading" when talking about vertical monopole antennas) requires the smallest inductance, and is often easier to construct than off-center loading. So why not always use center-loading? This is primarily driven by coil losses, hence, efficiency of the antenna. The coil losses basically depend on the current, coil dimensions, material, construction, and core. Depending on the diameter of the radiator element (tubing, wire) and installation height, compared to the wavelength, the most efficient placement of the loading coil is somewhere between 30 and 60% away from the feedpoint (ref. 8, 9). I.e., around the mid-point. The radiator and reflector of the KJ5VW antenna are "mid-element loaded". Note that the efficiency-vs-placement curves are fairly flat over a relatively large range around the mid-point. I decided to build a lightweight version of the KJ5VW design. Instead of attaching the dipole wires to wooden dowels, each leg of my dipole and reflector consists of a 10 ft ( = 3 m) lightweight telescopic fiberglass fishing poles. Got them at the end-of-summer sale at a local supermarket. The poles have 3 collapsible sections of 4 ft. Each pole only weighs 4½ ounces (130 grams)! Note: some such poles are made of carbon fiber or with graphite. I do not know if they are conductive for RF and cause undesirable loading (or losses) of the dipole. The total weight of my design is only 2.4 kg (5.3 lbs) - about one third of the KJ5VW design (6.8 kg, 15 lbs). Obviously, the fishing poles are more flexible than dowel rods, so they tend to flop around when its windy! Each coil core consists of a 7 cm (2¾ inch) long section of 1/2 inch Schedule-40 PVC pipe from the building supply store (21.4 mm outer diameter; 15.8 mm inner diam). This is not the lightweight light gray pipe, but heavy duty, thick-walled "rigid non-metallic conduit - above ground underground" pipe. However, this is not critical for this application! Loaded-dipole calculators (e.g., ref. 10A/B/C) suggest that - for the given dimensions of the antenna - the loading coils should have an inductance of about 8.5 μH. Coil calculators (e.g., ref. 11A/B/C) suggest that the KJ5VW coils have an inductance of about 9 μH. That's in the ballpark - and, as over 30 years of professional engineering experience has taught me: anything within ±20% is within engineering accuracy, hi! Out of curiosity, I checked the actual inductance with my miniVNA antenna analyzer (series & parallel resonance) and with my dip-meter (ref. 12), and found 8.9 μH. Of course, accuracy of the measurement is affected by the tolerance of the capacitor value. When new, ceramic disk caps typically have +80/-20% tolerance, milar polyester typ. ±5 or ±20%, tantalum typ. ±10 or ±20%, metalized polypropylene typ. ±5, ±10, or ±20%, electrolytic typ. ±20%, etc. Note that cheap LC-meters typically measure inductance and capacitance well below 100 kHz, and the indicated values may not be valid at RF frequencies. My coils are cylindrical and wound on a PVC core. 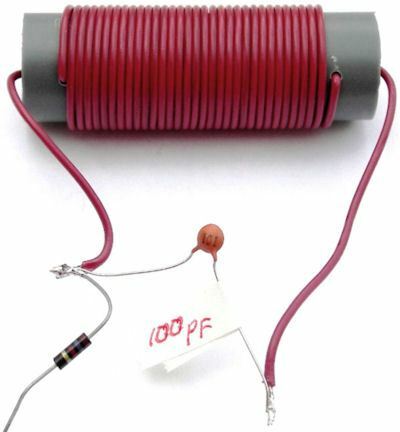 The same inductance can be obtained with small toroidal iron powder cores: e.g., about 30 turns on a T-130-2 core (1.3" diameter), and about 45 turns on a T-50-2 core (0.5" diameter). Ref. 13. You may have to stack 2 or 3 such small cores to get 4x or 9x power handling. I used 2 meters of PVC tube of 4 cm diameter as a temporary mast, stuck into a heavy umbrella stand (see Fig. 9 below). The antenna boom is made of the same material: 2 sections of 135 cm (4 ft 5") in length (cut from a standard 3 m section). They are mounted on top of the mast with a T-piece. I did not glue the sections into the T-piece. This way, it is easy to disassemble and experiment with the boom length. 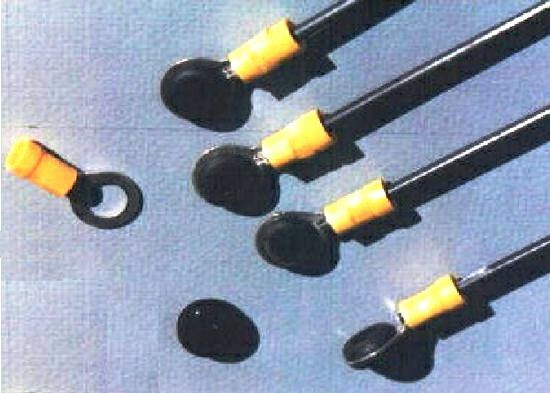 Once installed into the T-piece, two long nails prevent the boom-sections from turning and slipping out, and the T-piece from turning about the mast. Obviously this won't hold up under windy conditions, but it is fine for experimental trials and fair weather mobile/portable use. The fishing poles fit tightly onto 18 mm diameter dowel rods that run through the ends of the PVC boom sections. The dowels were cut to length such that the fishing poles are almost up against the boom when they are fully "impaled" on the rods. Shrink tube was used at the tip of each pole segment, to keep the wire taught. For the same purpose, tie-wraps were used at the base of the poles (didn't have shrink tube of sufficient diameter). It takes about 10 minutes to assemble or disassemble the antenna. 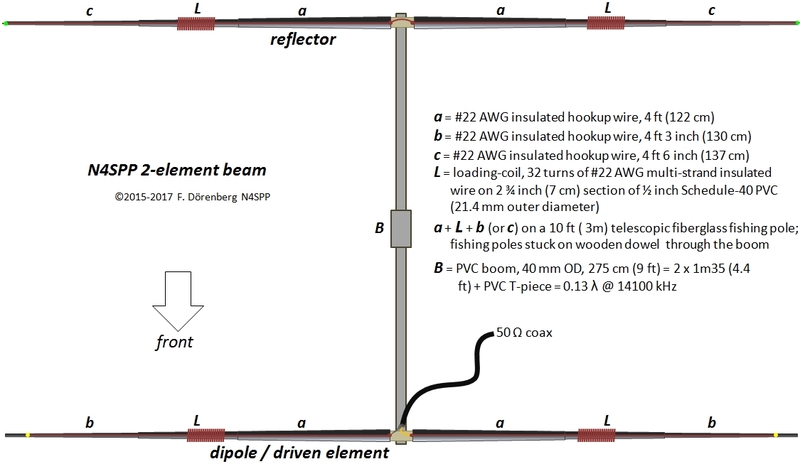 As indicated above, I first built the dipole by itself. The coils are slid over the fishing poles, until they are at the mid-point. The wire on the feedpoint side of the coils is attached at the feedpoint, with about 10 cm (4") excess, for connecting to the feed line. The wire on the opposite side of the coil is pulled taught and attached near the tip of the fishing pole. The dipole is then installed on the boom - by itself (i.e., without the reflector). Once the dipole of the driven element is tuned, remove it from the boom, and install the reflector "dipole". Tune this dipole just like the driven element, but to a resonance frequency that is about 5% lower than that of the driven element. In my case: 0.95 x 14150 = 13445 kHz. This requires that the wires on the inside and/or the outside of the loading coils be longer than those of the driven element. Alternatively, the loading coils could be made slightly larger, but coils are much harder to tune... After tuning the reflector, interconnect the wires at the feedpoint. See Figure 8 above. Then re-install the driven element dipole. Done! An SWR plot of the antenna is shown below. The original KJ5VW design indicates a 2:1 SWR bandwidth of about 250 kHz. At the installation height shown in Figure 9 above (only about 2 mtrs = 6+ ft), my Yagi has a bandwidth of about 220 kHz . I did not play with the antenna geometry to get to SWR = 1. My transmitter has no problem with SWR = 1.34. Update of September 2018. At the time that I built and toyed with this mini beam (10 years ago! ), I did not do any pattern measurements or simulations. Also, as you can see from the photos, I installed the antenna only about 2 meters (6+ ft) off the ground, which is only about 0.1 wavelength, which is not enough, and results in too much upward radiation. These days, Web-SDRs are plentiful (e.g., websdr.org), so measuring the pattern would be relatively easy. I expect this half size beam would perform like a full size dipole, with some directivity and F/B depending on the installation height. Ref. 14 is a simplified NEC model that I just slapped together. It works fine with the excellent 4NEC2 freeware modeling package. You would have to tweak it to the exact dimensions and your installation height. The Yagi described above is a straight-forward 2-element beam antenna. The driven element and the reflector are straight and parallel. There are many variations that have a bent driver and reflector. These shapes allow a significant reduction in size (and turn radius) compared to a full-size 2-element Yagi - without having to resort to loading coils and associated losses. On top of that, they can have larger forward gain and significantly larger front-to-back (F/B) ratio than the standard full-size configuration. Ref. 14. Ref. 3: "5-Band Yagi (20M/17M715M/12M/10M)", product brochure of JK Antennas. Note: I cannot endorse this antenna, as I have no experience with it. The manufacturer is welcome to contact me, to donate such an antenna for trials. Ref. 6: "Monoband Yagi for 20 meters - more dBs for the buck" by Ken Kemski, AB4GX (aluminum tubing instead of wires; still center-loaded but the director and reflector are about 1m2 / 4 ft longer). Ref. 10C: "Loaded dipole calculator (.exe)" by Al Legary (VE3SQB). Note: the GUI of this calculator shows inductance as "mH" instead of "μH"! Ref. 11A: "Helical coil calculator" on pages of the Tesla Coil web-ring. Ref. 11B: "K1QW Inductor Calculators"
Ref. 11C: "ON4AA Single-layer Helical Round Wire Coil Inductor Calculator"
Ref. 13: "Turns-length calculator for ferrite and iron powder core toroids"